Sam Stewart presents the Seven Towers Supporters' Club's December Player of the Month award to Allan Jenkins. Looking on are Allen Stewart, Uel Allen and Tommy Patterson. For a few marvellous seconds at the Showgrounds on Saturday, it was just as if Gary McCutcheon had never been away. Pouncing on a loose ball before rifling a shot over Glenavon keeper James McGrath, it looked as though McCutcheon’s goal to bring the score back to 3-2 might give Ballymena United hope of getting something from the game. Instead, within 60 seconds, Ballymena had conceded a fourth goal as another defeat was chalked up in the losses column. While McCutcheon’s arrival will undoubtedly add to United’s attacking prowess, it’s the mayhem at the other end of the pitch that will be giving manager Glenn Ferguson the most concern. 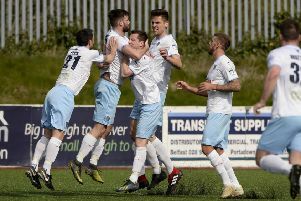 Ballymena’s 25 league games to date have produced a remarkable 90 goals - a staggering 56 of them in the Sky Blues’ net. Ballymena’s line-up featured three strikers in Darren Boyce, Matthew Tipton and Gary McCutcheon - although McCutcheon had a more withdrawn role when the action started, one where Ferguson believes Ballymena will get most out of him. The natural width of Neal Gawley and Alan Teggart was sacrificed for a midfield which included Allan Jenkins, Brian McCaul and Gary Thompson - all players whose natural inclination is to get forward into attacking positions. By a remarkable coincidence, while flicking through the TV channels after coming home from the match, I came across the classic war movie Zulu. There have definitely been a few Rorke’s Drift-style moments for Ballymena this season - in particular, when the Sky Blues lose possession, it’s all too common to see the opposition burst forward in numbers against a hopelessly outnumbered Ballymena defence. It’s too easy to simply point the finger at the back four, whose own forms as individuals has been patchy - there just seems to be something in the way Ballymena are set up, particularly when defending against counter-attacks - that doesn’t look right. The loss of Gavin Taggart to long-term injury hasn’t helped either. He may not be every fan’s favourite but his ability to break up play in the middle of the park sometimes isn’t noticed until he’s not there. It’s particularly ironic that Ballymena’s defensive problems should have surfaced this season, when scoring at the other end hasn’t been as much of a problem as in recent seasons. Over the past two years - since the departure of McCutcheon to Crusaders - United’s relative lack of firepower has been offset to a degree by the fact they have been relatively hard to break down. Remarkably, Saturday was the EIGHTH league game this season in which United have scored twice and NOT gone on to win the match. When you’re looking at having to score three times to be in with a realistic chance of winning a match, then something is clearly not right. The defensive problems are something which United can ill afford to repeat as they embark upon their Irish Cup campaign this Saturday. A home game against junior opposition in the form of Crumlin Star would appear to be just what United need to settle their nerves, but it’s a tie fraught with potential danger. It’s difficult to accurately judge the merits of Amateur League sides in this country because some sides who I feel could compete at a higher level will never get the chance to do so, simply because their facilities don’t meet the grade but Star’s rapid progress through the Amateur League is ample evidence that Saturday will be no cakewalk. After last season’s exploits in reaching the final, exiting at the first hurdle this time around would be very much in the unthinkable category.